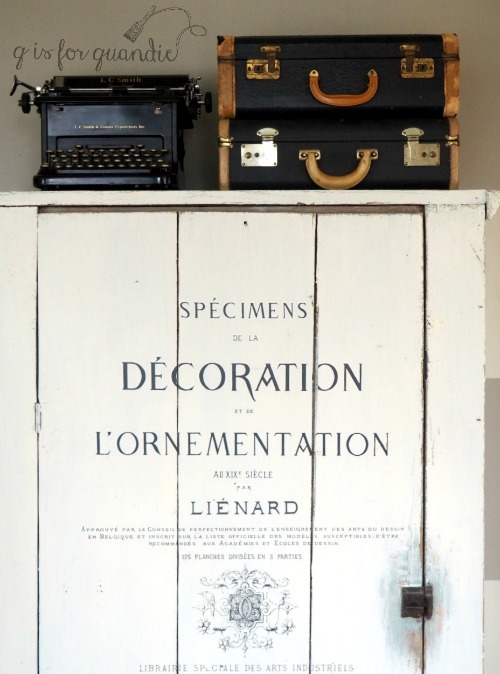 the specimens de la decoration cupboard. I’m not terribly savvy when it comes to Facebook. I don’t seem to notice when people leave me messages there, so if you have ever left me one and it took me forever to get back to you, please don’t take it personally. Somehow I just don’t see them. I also rarely post stuff on Facebook. I do have my blog linked to my Facebook page so my blog posts appear there automatically, but if you really want to interact with me the best way is to leave a comment here on the blog. That being said, I recently joined a new Facebook group, How to Paint like a Pro, that was started by the Fusion people. It has reminded me to never underestimate what you might learn from a group of like-minded individuals on Facebook. I was randomly perusing the posts and I stumbled across one about some new furniture rub-on’s that are available from Sweet Pickins. Seriously, are you freakin’ kidding me? How long have I been wishing I could find large furniture sized rub-ons?? And how did I not know these were available? I immediately dropped everything I was doing and went online and ordered two. Each one was $23, plus I paid a flat $6 for shipping. I think that is a bargain when you consider that one is 24″ x 36″ and the other is 18″ x 36″. These are large rub-ons (or transfers, if you prefer). They also arrived lickety split. I ordered them on Wednesday and they arrived on Friday. And I simply could not wait to give one a try and luckily I had the perfect ‘canvas’. 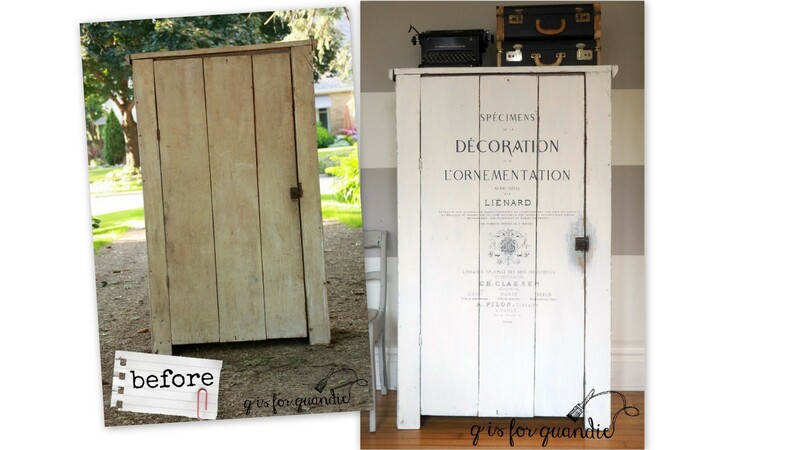 A couple of summers ago I purchased a pair of primitive cupboards. I sold one, but kept the second one. It was a bit dingy and had some water stains. 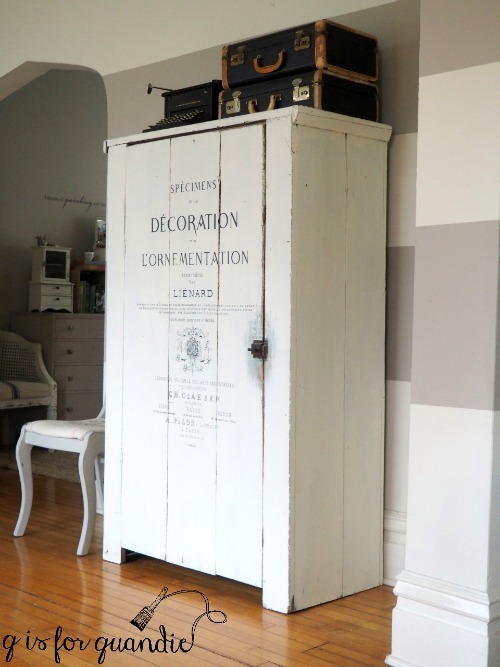 I was planning to use it in my bedroom, and I even went so far as to paint it with one coat of Miss Mustard Seed’s Eulalie’s Sky, but that was as far as I got. It had been sitting out in my carriage house ever since. 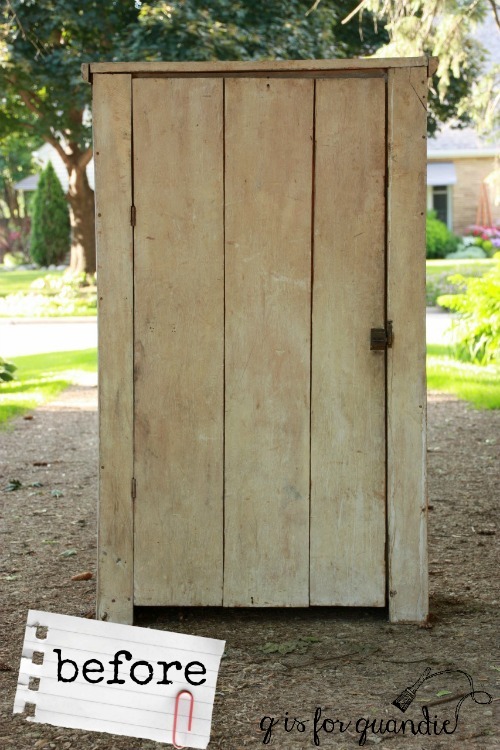 I even removed the door and used it to display merchandise at my last Carriage House Sale. 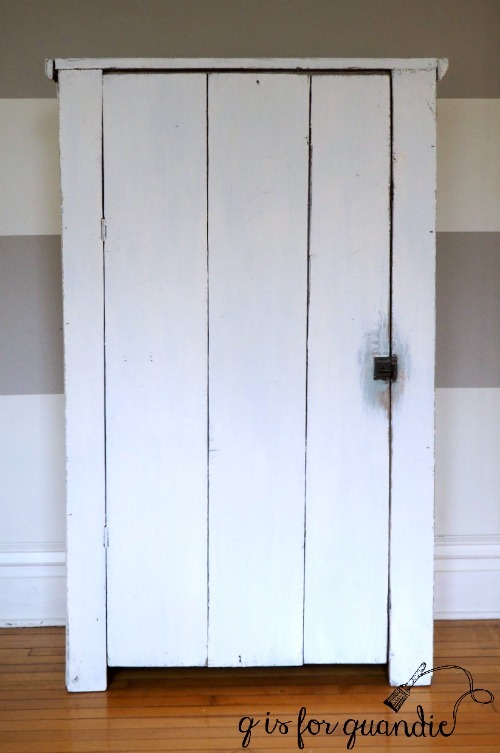 I wanted to go back to white, so I started by painting the cupboard with a couple of coats of Rachel Ashwell’s Clear Primer. Those water stains that I mentioned earlier had bled through the Eulalie’s Sky, and I didn’t want to see them coming through the white. Next I added three coats of Miss Mustard Seed’s Linen milk paint. The primer did its job perfectly, no stains. 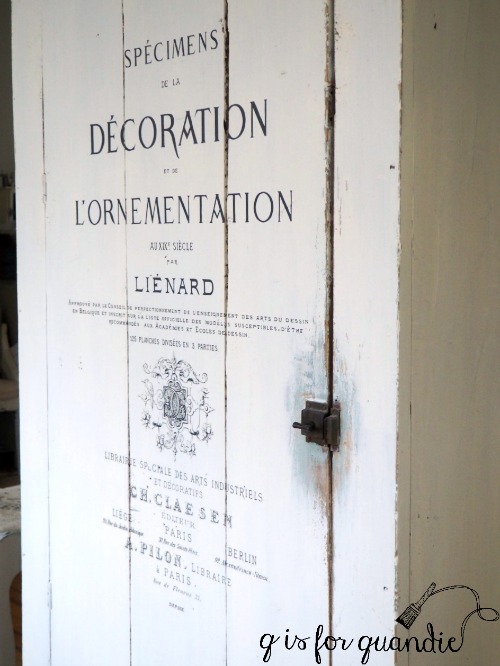 I intentionally left the area around the door’s hardware unpainted and blended my paint around the edges of that area, I love the worn look it gives the cupboard. I also sanded the edges a bit to distress. You can’t see that very well in the photos but it did make a difference. Next I separated the transfer from its backing paper and taped it in place on the door. I adjusted it a couple of times to get it centered and straight. Once I was satisfied with the placement, I used the little wooden tool that came with the transfer to carefully rub the entire design onto the door. This was a little putzy and a bit of an arm workout to be honest. It took close to 30 minutes to do the entire thing. But it was so worth it! Once I was satisfied that I had the design rubbed on sufficiently I very slowly and carefully pulled away the plastic sheet it came on making sure as I went that the entire design was adhered to the cupboard door. By the way, these transfers are charcoal grey rather than black. I like that about them too. In fact, I could not be any more in love with this product, or this cupboard. So much so that I am going to keep it right here in this spot. You may have realized at this point that this is where my Kitchen Scale buffet used to reside. Yep, it’s being replaced. I’ve actually been thinking about making this switch for a while. You see, the thing is, this is the room that I paint in during the winter. Instead of housing china and silver, my buffet was storing paint supplies. This cupboard is going to work so much better for that. 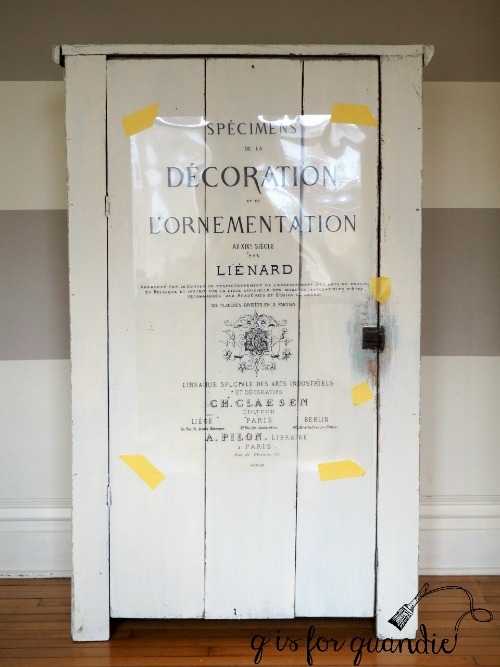 Somehow it now seems entirely appropriate that the door to this cupboard says “specimens de la decoration et de l’ornementation” right? By the way, I didn’t alter the inside of the cupboard at all. 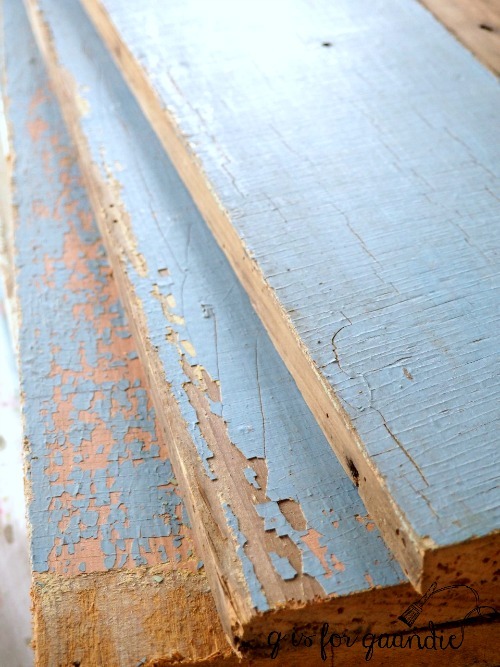 It came with these painted boards as shelves and I just love their chippy patina. 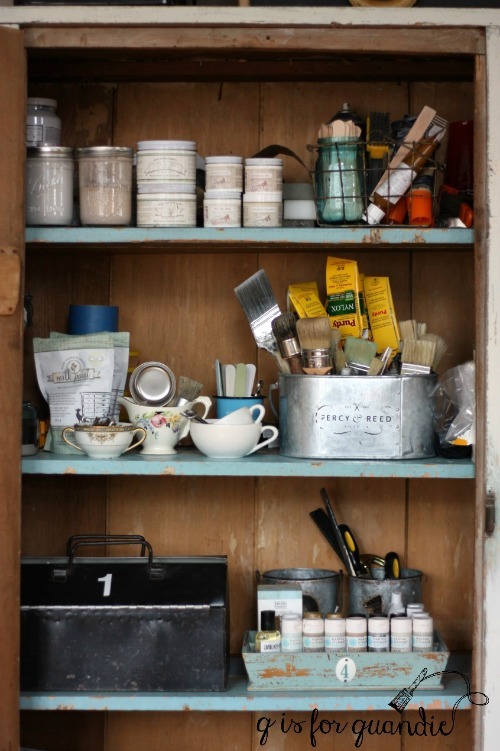 After all, I’m just storing painting supplies in this cupboard. If I was going to use it for clothes or linens I would add a coat of two of some kind of sealer to the boards. What do you think? Would you have kept the buffet, or made the switch like I have done? And what do you think of the cupboard’s new look? If you’re thinking of ordering a couple of transfers yourself, I should warn you that I went back and ordered six more yesterday so you better get on it before they are all sold out. And P.S. the Kitchen Scale buffet is for sale. Check out my ‘available for local sale’ page for more details. Sharing at Silver Pennies Sunday. Previous a toolbox towel bar. Next methods for transferring graphics. Oh that is just beautiful ! I’m off to the site now! Looks fantastic! Don’t you just love rearranging stuff in your own home? It makes such a difference. Maybe this will make me be less lazy to change things up. I was happy to find them thru Prima Decor Marketing, the ladies that came up with these ‘lovelies’? I bought 3 but have not yet had time to try them out!! Looks Great!! 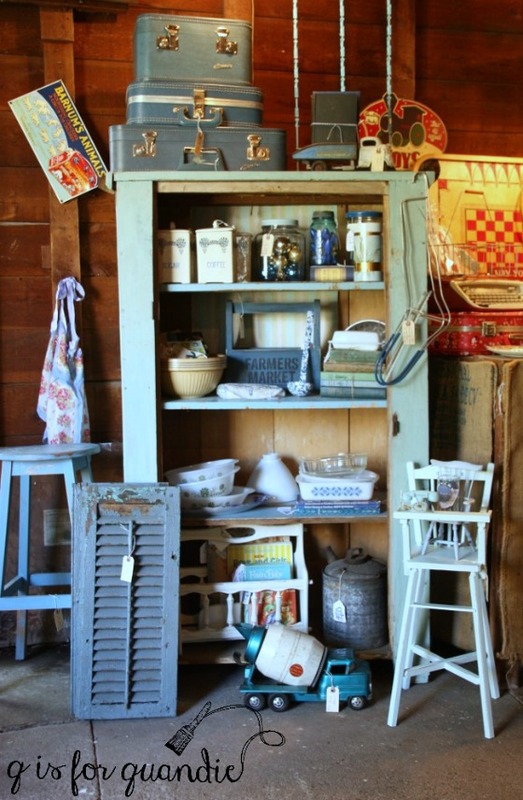 I am putting on a buffet that needs some love….cant wait to get to it!! Glad you found them….sooo pretty. They have other neat stuff too!! Be sure to take a look!! Thanks for the heads up on that! I just found them quite a bit cheaper online at scrapbook.com by doing a google search on Prima Decor Marketing. I also found Prima Marketing but it’s one of those places where you have to “log in” ie. provide your contact info to get prices. I’m not a fan of those sorts of arrangements. Is there some other way to order directly from Prima Decor Marketing Pauliegirl? Go to acherryontop.com. They carry the molds. I don’t know about the transfers since I haven’t looked. A great website. I use them all the time. Thanks for that resource Ruth. I’ll check it out! Iron Orchid Designs-IOD-these are the ladies that produce these amazing products!! I purchased some of the molds and have been doing resin pours in them (takes practice, and resin is NOT cheap) and going to sell the resin items, so people like us can decorate our furniture!! The flowers, labels, keyholes!!! FUN, FUN, FUN!!! Let me know if you need anything!! I’m having a hard time picturing what these molded resin pieces look like. I’m definitely going to have to do some research and find out more. 2 days ago I was looking on Amazon for transfers and found them. Much less. The seed one was $10 instead of $15. Please check out. Dang! Wish I had thought to do that before I ordered more! Well … live and learn. Quite lovely and a keeper for sure. Since you’re in a mood for learning about resources, check out Iron Orchid Designs. They not only have large rub on transfers for furniture and walls, they have the best molds for architectural ornaments. I own their first ones and they are to die for (I just ordered their newest ones). The molds are industrial type rubber and can be used with paper clay, hot glue, plaster, even cake decorating. You will swoon over the keyholes, escutcheons, etc. What is better than making your own ornaments endlessly? I believe they have demos on youtube. Let me know what you think. I’ll have to check out the youtube stuff, but in the meantime, I went directly to their website and they only sell wholesale. One of the online sources they list is scrapbook.com though. Oh yes, I forgot…. on you tube you can see demos of their oversized vintage looking stamps which they use for stamping on fabric and walls. There is one demo on youtube showing how they do a distressed wall with the stamps that will make you drool. Iron Orchid rules! Awesome! I didn’t know these existed. I usually make my own but they are small. I’ll have to check them out! Definitely check them out. I think they give a ‘cleaner’ look than using transfer gel and a printed design on paper. Plus, the size is a definite plus. 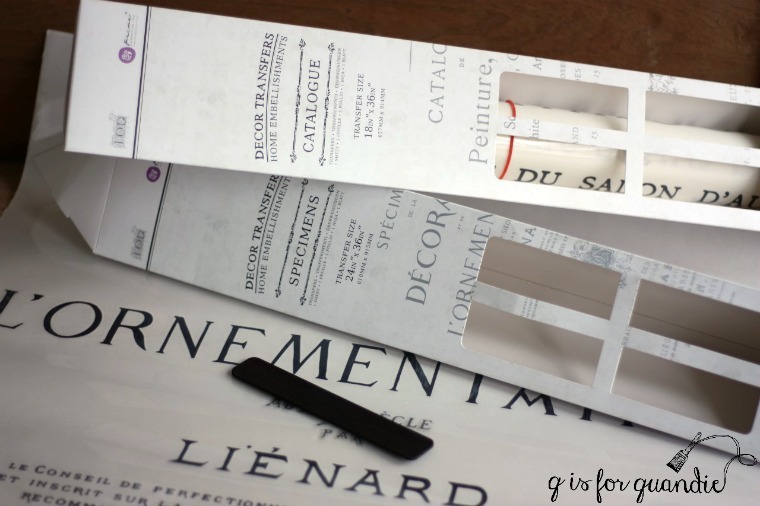 I love these transfers (so much easier than other transfer methods I have tried- I usually end up rubbing off the image as well as the paper backing!) Thank you for sharing this website to purchase as I have been eagerly awaiting the new releases. It turned out great! Love the large transfer and it seems more practical then the buffet. Wow what a great idea! I have only used a stencil or traced and then hand painted on furniture. I know that there is transfer gel and other products out there, but I have been a little apprehensive to use them. I think that I will give one of these a try. Thank you for the information. The cupboard is great! I’ve done all of the above, and each method has its pros and cons … hey … I think I need to write a post about that, don’t you? you are speaking my language with the rub on vs. transfer via inkjet print. i will definitely check this out. as for your buffet…i love the color and that furniture style is one of my favs. we had its twin and made it into a kitchen island with a reclaimed wood top for a customer. swooning. That sounds like a great idea, I bet it turned out gorgeous! The cupboard looks great! Don’t worry about spending a couple extra bucks. You helped to support another artist, and Sausha has detailed tutorials on her site. 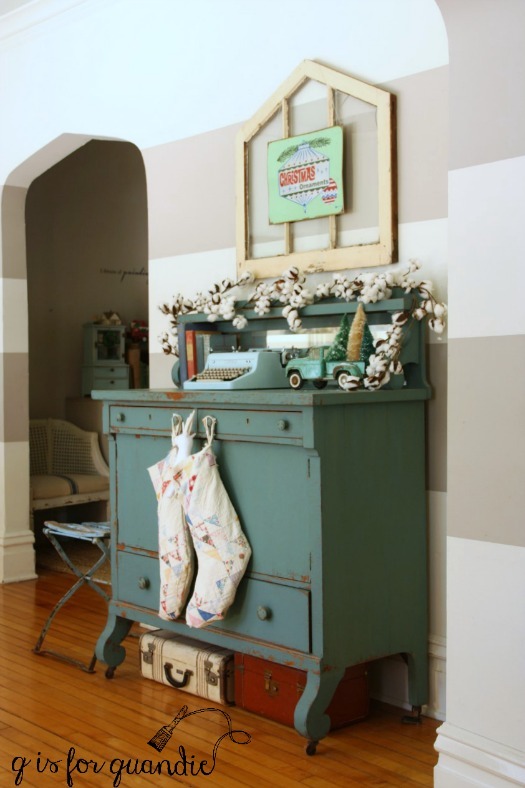 Plus, she has the prettiest milk paint colors. Amazon can be deceiving … you really have to check the dimmensions of the decal … I almost purchased a 12 x 12, which wasn’t what I wanted at all. 😀 Thanks for sharing! Thank you for bringing up those points Cynthia. I do like to help support other artists! And I agree, Sausha does have some gorgeous milk paint colors. I’ve used “In a Pickle” (which you’ll see me using again here soon) and “Sweetie Jane” and loved them both. Sausha is the best. She gave me dreams of possibilities when I could only imagine stain on wood. I just ordered Ocean from her. And you Linda, are the perpetual rock in my shoe, always sending out these enticing posts furtively saying, “get off that chair and pick up a brush,” Yet again the cupboard is impeccable. I AM however concerned about the little pinholes in the shelves. It is looking to me like powder post beetle. Did you have your Ken check it out? Maybe you should “le specimens” a little empoisonner on them and seal. Otherwise, “Viva la decoverte.”. I did a little quick research on powder post beetles (here) and I think I’m safe. It sounds like they prefer new wood. It’s possible these shelves had the beetles at one time, but unlikely that they still do. I’ll keep an eye out for the telltale signs though (little piles of fresh sawdust), just in case. I think as long as the wood has been kiln dried you are good. I bought some wood from a lumber distributor here in GA, with lovely little holes and blue staining from the beetles, very neat looking!! Hopefully I can get some more and do a wall!! I’ve heard people say that they purposely add little holes to new lumber to help age it too. Funny how something that was once probably considered a bad thing (insects infesting your wood) is now a prized quality! Well if this isn’t absolutely fabulous! This is definitely at the top of my favorite things you have conquered. Seriously holy cow that is cool looking. I love it on that wall too. That will be much more convenient to store your tools/supplies in as well. I have been under a rock too much work to little time for the fun stuff. My mailbox is overflowing hince why I am just catching at nearly 11:00 pm on a Wednesday. Aww, thanks Amy. That is so nice of you to say! And yes, I’m with you, five million rub ons stat! your cabinet looks too cute!! thanks for sharing where to purchase the rub ons. I love your new Specimans Cabinet Linda! Sad to see your Kitchen Scale buffet gone, but I agree, your new cabinet holds more painting supplies. I have not yet had the opportunity to play around with IOD transfers but I am hoping to soon. Thanks for sharing! Be careful Sue, those IOD transfers are seriously addicting!